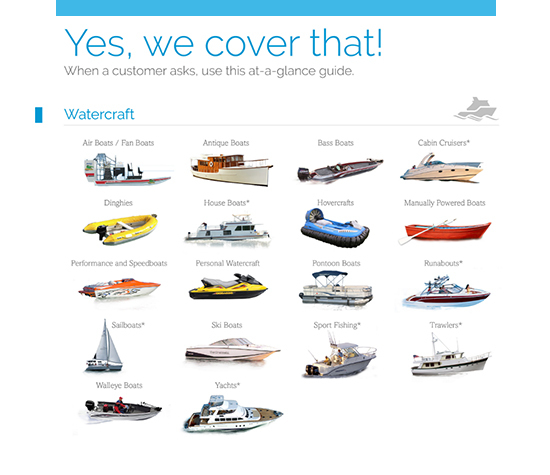 American Modern can help guide you through the unique requirements and coverage options for watercraft, from yachts to rowboats and everything in between. We protect boats up to 64 feet in length and, in many states, up to $1 million in value. Our flexible boat policies include multiple discounts and several coverage options, which provides more comprehensive protection than a homeowner’s endorsement would. Make sure your customers have the coverage they need to keep their dream afloat. Both avid and occasional boaters who understand that a boat is an investment look for coverage that does more than just provide liability. American Modern’s program ticks all the boxes and then some. In AMsuite states, we offer a special program just for yachts. A Jet Ski® or Wave Runner® may qualify for protection under our personal watercraft program.